William Morrow Cookbooks, 9780061435041, 272pp. 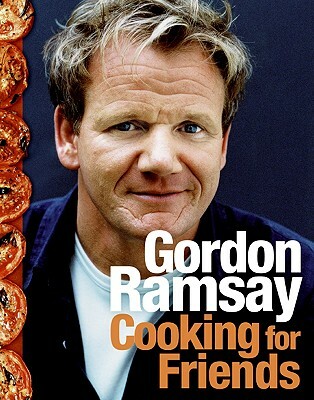 In Cooking for Friends, award-winning chef, world-renowned restaurateur, bestselling author, and Hell’s Kitchen star Gordon Ramsey offers us more than 100 exceptional recipes from his own family table. The holder of ten Michelin stars and ranked as one of the world’s most powerful celebrities by Forbes magazine in 2008, the sometimes intimidating Ramsey displays his softer side, sharing the scrumptious dishes he serves to his own family and loved ones. This intimate, full-color cookbook is not a collection of royal feasts for the lofty and privileged. Gordon Ramsey is Cooking for Friends—with all the warmth, care, and love that entails. Gordon Ramsay's radical career change at seventeen, from soccer player to chef, led to the awakening of exceptional talent. He is now the holder of an extraordinary ten Michelin stars, for his restaurants in London and New York, and is at the head of a food empire, with restaurants in places as far afield as Tokyo and Prague. He has produced a number of bestselling cookbooks, published a hugely successful autobiography, Roasting in Hell's Kitchen, and starred in a stream of successful television series, including the award-winning Ramsay's Kitchen Nightmares and Hell's Kitchen on Fox. Ramsay and his wife have four children and live in England.